At PwC we are passionate about constantly creating and adding value for our clients and our people. It’s an inspiring backdrop for building your career, and can include making a difference to a public or private company, government or charity. 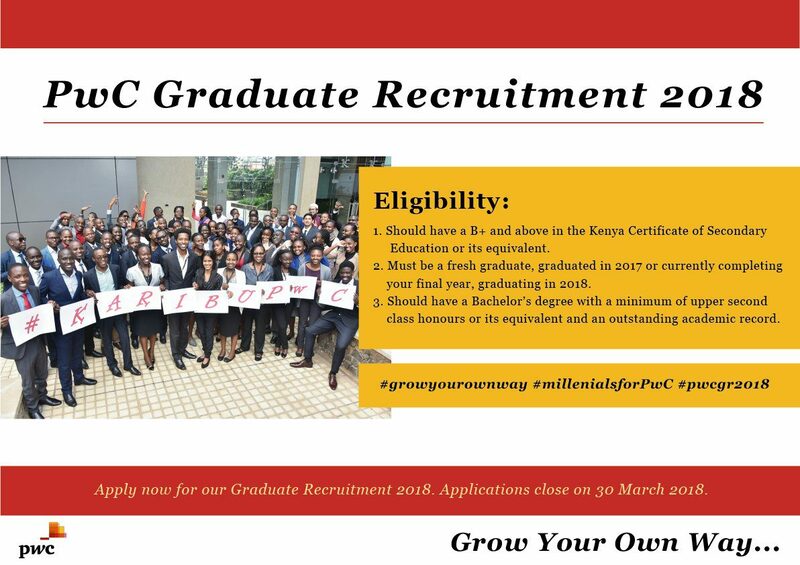 Our graduate associate programme provides exposure to the distinctive breadth and depth of expertise across our network helping you to build an informed and global perspective.Our people are what makes PwC the most distinctive professional services firm in the world and in our region. We are committed to growing the careers of our graduate associates who are the next generation of exceptional leaders. •Have a B+ and above in Kenya Certificate of Secondary Education or its Equivalent. This is an opportunity for you to grow an experience that will cause you to reach your full potential, make a difference and shape your future. If this sounds like a good next step towards building a meaningful career, apply online between 7 March and 30 March 2018.